Two mosques were burned down in North Gonder. Sheik Mohammed Amin, President of the Ethiopian Islamic Affairs Supreme Council, said the Council "strongly condemns" the torching three Mosques in two separate Woredas in South Gonder Zone of the Amhara regional state. The Shiek Mohammed's statement came after a third Mosque was torched last Sunday in Andebet Woreda, Jera Gedu Kebele in South Gonder zone. 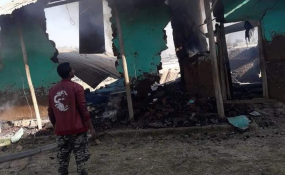 This was the second attack after two mosques were torched in Esete Mekane Selam town in south Gonder zone on February 03. The incident happened after false claims that a picture of St. Mary was found circulating at a wedding of a Muslim couple among other decorations, according to The Amhara Mass Media Agency. Although it was denounced by reps of both religions & elders at the event, later on two Mosques were burned & one damaged. Another report by the BBCAmharic quoted a local police officer as saying that claims by group of youngsters who said they have seen St. Mary's picture being crushed at the wedding led to the violent attack on the Mosques and looting and damaging properties. Sheik Mohammed added that such acts don't represent any religion but are orchestrated by those bent on destroying the values of Ethiopia's inter-religious tolerance. "This is a tragic incident; it's also a grave crime. We strongly caution for those responsible to face the law," he told local media. In a separate news, seven churches belonging to Ethiopian Protestant Church were destroyed and torched in Halaba Kulito town in Southern Ethiopia on Saturday February 09. According to the Alaba zone communication office head Mohammed Nur, the churches were destroyed after a fake news circulated on social media claiming that Mosques were attacked in Durame area, according to Ethiopia Live Update. Sheik Mohammed Amin also condemned the attack during his presser. He further cautioned that burning worshiping places will pave ways to instigate a grave religious violence in the country and needs to stop as soon as possible. He called on all religious institutions to step up security around worshiping places. He also a careful use of social media in order to avoid further violence.